Sell your digital music at your live gigs or give a digital copy along with your vinyl records. 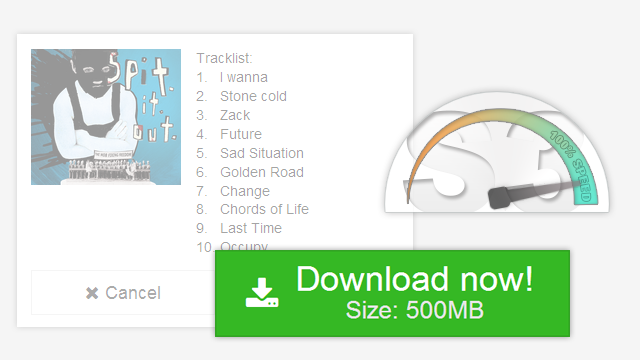 Promote your film with low-cost download cards, full with trailers and soundtracks. Give your clients a business-card with a special code, to view your portfolio. redeemoid is not just for songs and films. Use the cards to sell your ebooks and audio books. Add a special value to your product with customized download cards. The modern gift for a purchase. 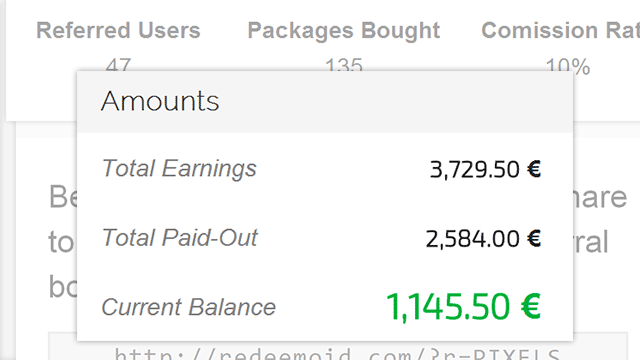 Our main goal is to make the redeemoid experience as awesome as possible! Have your codes print-ready within minutes. You don't need a computer science degree to get your own codes. Chose from different designs or simply submit your own! Make your cards a collectible. 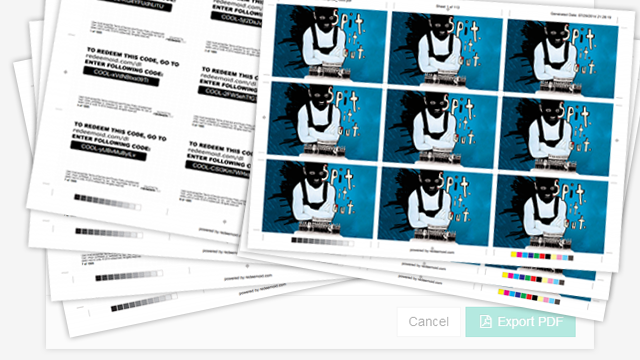 You press a button, we give you a high-resolution, print-ready PDF with all your codes. Need them as CSV or Spreadsheet? We do that too! Define code length and complexity. Buy as many codes as you need - no minimum volume. Add your own brand to each code. Get all kind of statistics about how your codes are beeing used. You like graphs? We have them! 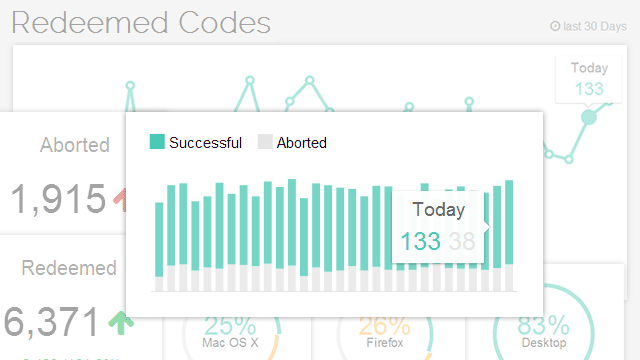 Get daily, weekly or monthly emails with detailed insights, about how your codes are performing. Your files will be hosted on blazing fast S3 servers. Forget about traffic limits and down times. 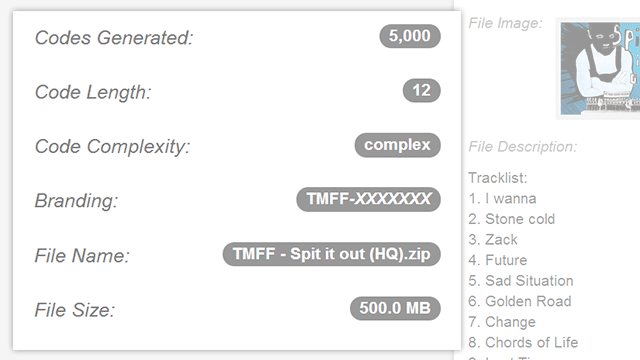 We know if a download fails for whatever reason. Only a 100% successful download will redeem a code. 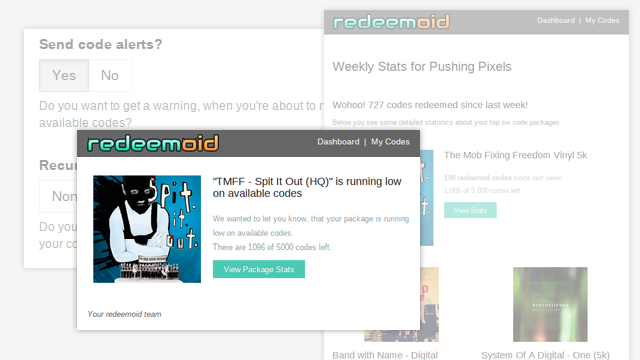 You know a band/friend/manager that need redeemoid codes? Refer them and earn money, when they buy new packages. Still not sure what all this is about? We've got you covered! A redeem code (aka. 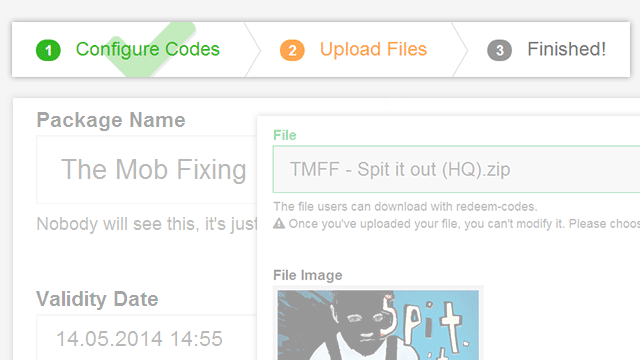 download code) allows your file to be downloaded from the internet quickly and securely. The way it works is simple: Each one of the codes is unique and gains the cardholder one-time access to your files. We offer one-time codes for downloads of digital user content. The files are stored securely and can only be accessed with a valid download card. Download cards are rendered invalid, as soon as a download was completed successfully. 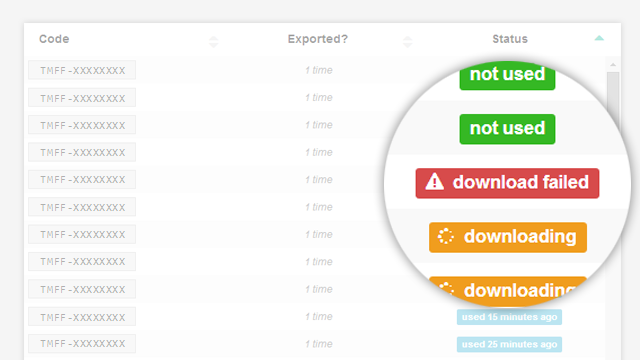 Incomplete downloads are recognized and do not consume the code. You create a new account by simply clicking "Sign Up" or "Buy Codes!". Confirm your email and start creating your code packages right away. 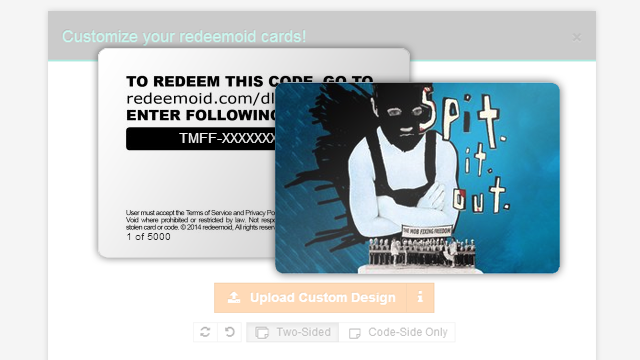 Not only will you get your customized redeemoid codes on a print-ready, high-resolution PDF, with your very own design, but also access to detailed analytics and insights about how your codes are performing, an option to export the codes to other file-types (like CSV or Spreadsheet) and full control of validity and download contents - at all times. We are constantly adding new features to make the redeemoid experience even more awesome. Missing something? You can submit your idea right here! Do the people redeeming my codes have to sign up for anything? Anyone who owns a valid code, can simply use it without registration. Keep it simple, right? Who's going to take care of file hosting? You don't have to worry about slow connections, down-times or bandwith limiting. We host your files securly on blazing fast Amazon S3 servers. Can I collect information about users who redeem their code? We share all kind of information with you about the usage of your codes. Those information contain browser, operating system, device-type, download status, redeem date and more. Code expiry can be freely set by the code owner. You can change the validity timeframe whenever you want. At all times. I want to sell my codes. Can I do that? Once you receive the codes from us, you are free to use them whichever way you want (as long as the content is not illegal in any way). I have a mind-blowing idea about how to make redeemoid even better. Where can I submit my idea? We can't wait to hear about it! You can submit your idea right here! Thank you a thousand times for helping us, making redeemoid as awesome as possible for all our users. Do you have any ideas what we should add? Awesome! Submit your idea right here! Don't hesitate and use our contact form, to ask us any question you might have. We'll do our best to reply to your message as soon as possible! Promised! Reached the limits of our configuration tool? Does your campaign/project have a particular detail not covered here on our site? Do you want to collaborate directly with our team? You're at the right place! If you have general inquiries, please send us your message through our contact form instead. Want to give us feedback? You can do this right here! Reply to We'll send your quote to this address. What's your budget you where aiming to? Amount How many Codes do you need? Length How long do you want your codes to be? How big is your upload going to be? Complexity A-Z, a-z, 0-9, !$*,_([A-Z, a-z, 0-9, !$*A-Z, a-z, 0-9A-Z, 0-9a-z, 0-9Different (specify in message) Those will be the characters we use for the codes. Branding Leave it empty if you don't need a prefix. Now please let us know about the details of your upcomming project.